It is extremely honouring to become a part of the fantastic team here at ElectricJive, bringing forgotten gems to the fore again: flatint’s wonderful share highlighting The Movers last week certainly gives you an idea of the treats in store for you! For this post though, we’re going to be departing from the soul train for a while and putting the focus on some straight, no-nonsense mbaqanga – the tasty musical meld that dominated the townships for some twenty years. Our rare share today is Good Luck Motella, a compilation LP from 1968, bringing together the most successful singles from the past year. 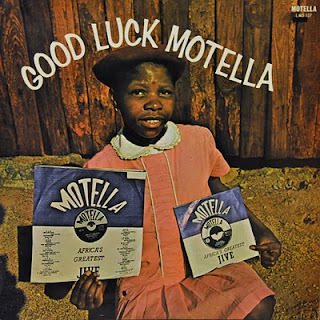 This LP is a classic example of the successful hit factory that was Mavuthela, Gallo’s African music subsidiary, the musical home of the biggest pop stars of the day. Some fantastic vocal jive is contained on this record, courtesy of the Mavuthela girl group collective under various names (Izintombi Zo Mgqashiyo, Dima Sisters, Mthunzini Girls, Mahotella Queens), with regular guest vocals from the King, Simon “Mahlathini” Nkabinde. All this along with two sax jives from the force behind the scenes – the wonderful Makhona Tsohle Band who so defined the mbaqanga scene for so long – makes this a truly definitive record. I won’t spoil it by telling you what each track has in store for you, but I will say that fans of Mahlathini & The Mahotella Queens (post-1986 reunion) are in for a surprise: this record contains the original versions of “Izulu Liyaduduma” (recorded for Thokozile in 1987), “Sihambile” (from 1994’s Stoki Stoki) and “Thokozile” (the title track on their 1987 album). Thanks to the folks at Electric Jive for inviting me to participate in this fantastic forum. For my first post, I would like to revisit a thread started here in December last year. In the liner notes of the CD reissue of Ntemi Piliso’s 70s recordings with the Members, Rob Allingham reveals Lulu Masilela’s dismay at first hearing Abdullah Ibrahims’s (aka Dollar Brand) classic 1974 track Mannenburg. For Masilela this South African anthem sounded more like a slowed down version of Zacks Nkosi’s Jackpot recorded at least 10 years prior. Perhaps out of protest, Masilela wanted to re-record the tune and credit it to Nkosi. That same year he approached The Movers and they put together their version of Mannenburg featured on the album Repeat After Me. (1974, City Special, CYL 1029) (1976, Generation, GEN 3007) [Dabulamanzi will share this album soon.] Ironically David Thekwane, their producer, refused to let them credit the track to Nkosi, but they did have the pleasure of seeing their version completely outsell Ibrahim’s. 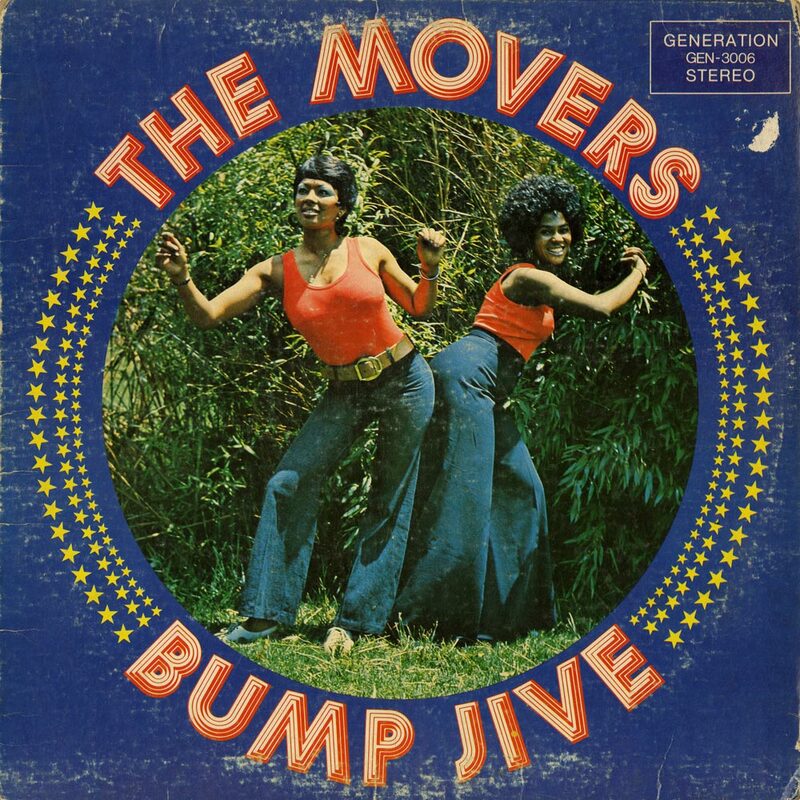 After their success with Mannenburg, Lulu Masilela and the Movers went back into the studio in early 1975 and recorded an even more popular album, Bump Jive, featuring again only two extended jazz-flavoured tracks. 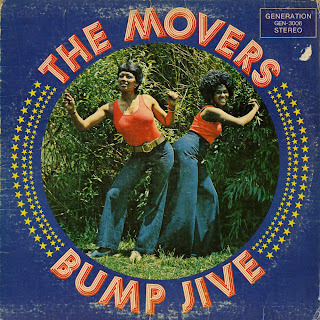 The extended play became as popular as the “bump jive” dance itself and with the introduction of disco, dominated South African jazz and soul music well into the early 80s. Today Electric Jive features this classic album—Bump Jive—first issued in 1975 on Teal’s City Special label (CYL 1030). The version posted here is from the 1976 US edition on the Generation label (GEN 3006). For a Movers discography visit the new flatint blog at flatint.blogspot. For additional information on The Movers visit the flatinternational archive of South African audio. JH Pierneef: The Baobab Tree - sold in 2009 for R11,8 million. As it is more than fifty years old, copyright on sharing images of this painting has lapsed. A heads up to electric jive visitors – expect an expanded menu of special sounds in the coming year. We are excited to announce that two South African music aficionados and vinyl collectors extraordinaire have joined our blog team. Siemon Allen (flat international) and Nick Lotay will be digging deep into their personal collections to share rare grooves that are just not available anywhere, anymore. Expect surprises and revelations of music whose existence is rumour. Nick will no doubt reveal more of the roots of mbaqanga, interspersed with additional helpings of isicathamiya and mbube. Siemon has already shared numerous gems with us, and, looking at his amazing and growing flatinternational archive we just know it is going to be a special year ahead. Please do keep our store of electricity charged with your feedback, additions, shares and encouragement. This blog exists for no purpose other than for the excitement of sharing great music, honouring the musicians, and hopefully turning on a whole new audience to sounds that might otherwise become lost. We avoid sharing music that can still be legitimately purchased. If we do share current music, it is most often with the permission and endorsement of the artist concerned. An early (1989) Zimbabwe jazz oriented album in which mellow guitar wizard Louis Mhlanga was centrally involved. Earlier, we shared a record from another Zimbabwe band, “Ilanga” – for whom Louis Mhlanga also played. Now based in South Africa, Louis has gone on to make some truly fantastic music, collaborating with the likes of Vusi Mahlasela (Live at the Baseline), Miriam Makeba, Hugh Masekela, Ray Phiri, Sipho Mabuse, and Busi Mhlongo. Mhlanga has also produced music for the likes of Thomas Mapfumo and King Sunny Ade. Saba Mbata was the original drummer for Thomas Mapfumo and the Blacks Unlimited. The other leading light, Michael Lannas was reportedly falsely accused of a crime and spent some time in jail. He is apparently living in the UK now. It would be a treat if I can get Louis to sign this old album when I see him playing live at the Rainbow on Sunday! While not directly referenced, Rick Van Heerden is most probably the saxophonist. Welcome to part one of a series of political propaganda and related recordings and ephemera. Todays item is a very rare flexi-disc that was produced by the ANC in 1970. The item was most likely manufactured in the UK and then sent by post and smuggled to South Africa. Despite the heroic optimism communicated it was to take another 24 years before the democratic vote was achieved. ‘African Jazz and Variety’ has been described as a programme somewhere between concert, dance and burlesque – with a touch of sensation and stereotyping. While it is certainly a mixed bag, this landmark 1952 ten-inch 33rpm recording presented by the South African Institute of Race Relations is an important archive of top African musicians deployed in a broad effort to convince white South Africans that blacks were capable. 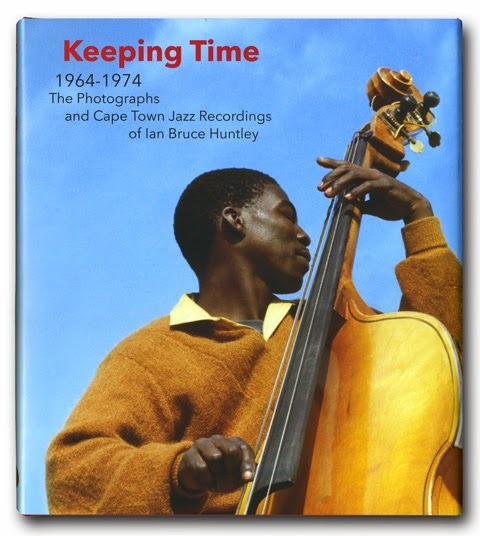 Musicologist Chris Ballantine has described this as “the liberal” approach to the use of music in the project of emancipating South Africa. In this ‘liberal’ approach, the role of music in social change “was to demonstrate to whites that blacks were worthy of better social and economic treatment – in short ‘moral persuasion’; musical performance as an ‘eye-opener’. A second role was to ‘explode the theory’ that ‘the black man is mentally not the equal of the white man’ - as opined by the newspaper Bantu World in 1935 on the eve of black American Paul Robeson’s planned (but then aborted) tour to South Africa. African Jazz and Variety was hailed by critics ‘as the greatest non-European show they had ever seen.’ In July 1952 the Durban City Hall attracted 55,000 (whites) in the 3 ½ weeks it ran there. Whatever African Jazz and Variety was, it gave exposure and impetus to stellar careers of some great South African artists, including Dorothy Masuka, Dolly Rathebe, and Thandi Klaasen. Victor Ndlazilwana was at the core of the ‘The Woody Woodpeckers’ and went on to great success with the Jazz Ministers. Ben Satch Masinga, who has already featured here on Electric Jive, went on to write the first musical in the Zulu language, ‘Back in your own Backyard’, amongst a host of important musical achievements. David Serame, who has had a long and distinguished career, modelled himself as a “sob-rocker” in the 1950s. Serame remains active, recently performing on Adam Glasser’s award-winning album “Free at First”. A 78rpm recording of Serame doing great Paul Anka covers can be downloaded from the links provided below. A rare African jazz gem to wish all visitors to Electric Jive a fantastic 2011. This 1976 album by "The Zola Kids" presents a smoking horn section which almost certainly includes Dennis Mpale on trumpet and Ntemi Piliso on saxophone - five of the nine compositions come from these two masters. The album art is by AK Ally, the man responsible for designing the As-Shams (Sun) label. The clenched fists and open palms suggest that this was drawn after June 1976. The music is however mellow marabi-tinged jazz with a ‘pinch’ of mbaqanga. Sorry about the slight clicks on the opening track.